I was in my 20’s when I read Richard Adams’s novel. That was some time ago, and although the particulars had been forgotten, I recalled it as an excellent, beautiful and intense book. It is adapted into an excellent, beautiful and intense movie. I’ve heard tales of people traumatized by this film in their youth, exposed to it by parents who assumed that an animated movie about animals would naturally be acceptable children’s fare. The level of violence — and perhaps more importantly, the frank display of suffering — makes it unsuitable for little kids. However, there is an attitude towards death that I think would be valuable for slightly older children, perhaps 10 or 11. Death is something to fear, yes, but it’s also something to be incorporated into your worldview, embraced as an inevitable part of life. The film handles death in a way that makes it both terrifying and poignant, haunting and lovely. The portrayal of death is touching, in a way that many films strive for and many fail at. And because death is established early on as a part of this world, it raises the stakes for the adventure. At any point, a major character could meet his or her demise. It makes for a truly thrilling tale, where the outcome of any perilous situation is not a foregone conclusion. It’s a mood that puts you in the mindset of a rabbit: danger is everywhere. Which in turn makes the peaceful, bucolic scenes more comforting, and the brief moments of comedy more enjoyable. The more I think about it, the more remarkable the tone of this movie is to me, an unusual sort of melancholic fable. And it’s wrapped up in a story that remains engaging, with suspenseful (and plausible) action, clever cunning and genuine pathos. It does it all without anthropomorphizing the hell out of the animals, too. At all times they look and move like the creatures they are meant to be. There isn’t like a “rabbit supermarket” they all shop at, or rabbit television or a rabbit baseball team. There are given the gift of language and they have a mythology, but that’s about as far as it goes in terms of making them human. And that makes the allegorical elements less heavy-handed. The issues the rabbits face are not directly analogous to issues we face, but there is a recognition there. Perhaps we don’t feel the pressure of constantly being on the lookout for predators… but we can know what it means when one group turns a blind eye to danger, or another builds a totalitarian society. We can appreciate the values of compassion and daring and sacrifice, even when we’re not being told that we should, that what they’re going through is just like what we’re going through. It’s one of those films that has as much allegory as you care to bring to it. The animation is in some ways, at some times, crude. It’s not a picture that dazzles with its technique. But after a while you don’t notice the flaws. You get pulled into this world of the English countryside from the rabbit’s point of view, a world both warm and menacing. Some of the most astonishing moments are when it suddenly spins into abstraction, a visual poetry that animation is particularly well-suited for. These moments never feel like they’re breaking the style, they arise quite naturally. Even when Art Garfunkel pipes in with “Bright Eyes”, it doesn’t feel out of place. In fact, it’s one of the picture’s most memorable, artful scenes. If Disney’s songs were as gracefully incorporated, I might enjoy their product more. The score by Angela Morley (like Wendy Carlos, a transgendered composer) is also splendid and effective, all the more impressive for being a rush job when the original composer fell ill. This entry was posted on May 15, 2015 at 7:24 pm	and is filed under Movie Reviews. You can follow any responses to this entry through the RSS 2.0 feed. You can leave a response, or trackback from your own site. Yes, Plague Dogs is also on my watchlist. 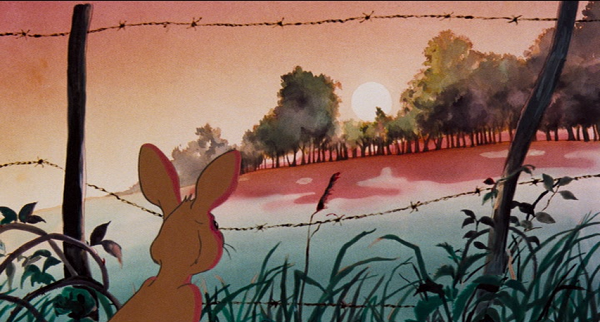 Also based on a Richard Adams, also directed by Martin Rosen, and also John Hurt as the lead voice.